Born on November 20, 1979, Ruben Gallego graduated from Harvard University in 2004 with an A.B. in international relations. He served in the U.S. Marine Corps from 2002-06; worked as a public affairs consultant during 2007-08; was vice chair of the Arizona Democratic Party in 2009; held a seat in the Arizona House of Representatives from 2011-14; and was elected in 2014 to represent Arizona’s 7th Congressional District in the U.S. House of Representatives, where he is a member of the Congressional Progressive Caucus. For an overview of how Gallego has voted on a wider variety of key issues as a U.S. congressman, click here. In 2012 Gallego helped lead Citizens for Professional Law Enforcement, a coalition of Phoenix-area political leaders, in an effort to oust Sheriff Joe Arpaio of Maricopa County, Arizona, because of the latter’s tough stance on immigration-law enforcement. That same month, Gallego was special guest speaker at a Netroots Nation conference in Phoenix, Arizona. 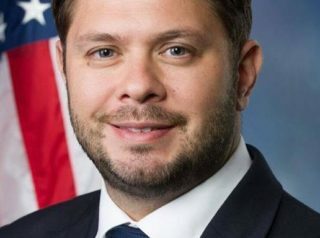 Further Reading: “Ruben Gallego” (Votesmart.org, Ballotpedia.org, Keywiki.org); Ruben Gallego’s Voting Records As a State Legislator (his votes on abortion 2012, abortion 2011-12, and Medicaid/unemployment benefits); “House Democrats Speak out on SB 1070 Ruling” (6-25-29012); “Arizona’s SB 1070 May Now Help Latinos Turn State Blue” (by Ruben Gallego, 12-6-2011); “Joe Arpaio Opponents Form Super PAC To Unseat Arizona Sheriff” (by Joe Celock, 9-25-2012); “Rep. Gallego Introduces ‘Enable DREAMers to Serve in Uniform’ Amendment to the National Defense Authorization Act” (4-29-2015); “Democrat Introduces Bill Banning Confederate Flag from VA Cemeteries” (by Awr Hawkins, 7-10-2015); “Democrats Oppose Putting Donald Trump’s ‘Racist’ Name on D.C. Hotel” (by Warner Todd Huston, 8-19-2015); “Arizona Congressman Looks to Keep Donald Trump’s Name off Washington Hotel” (by Mike Sunnucks, 8-17-2015); “Dem Rep Warns Immigration Officers Following ‘Illegal’ Trump Orders: ‘You Will Not Be Safe’” (by Alex Pappas, 8-30-2018).